We see a lot of computerized sewing machines nowadays and they all may seem very similar to one another. So what makes this Brother CS5055PRW sewing machine stand out among the crowd? What are its strengths and weaknesses? Should you buy it? Well honestly, we don’t know what you’re looking for but we can tell you everything about it in this review so you yourself can decide if it fits your needs or not. No sugar coating and sweet talk, it’s time for some good old fashioned hard facts and informative content. Let’s see what exactly does Brother CS5055PRW offer to its potential buyers. 1.2 Brother CS5055PRW – Is it Good For Beginners? This model is advertised as a multi purpose model that can work with any kind of material. The main characteristic of this model is the computerized system which provides a wide range of possibilities and an easy selection of desired work type. A lot of important functions are automatic which is also a plus. Having said that, let’s take a look at some of the traits and capabilities of this sewing machine. STITCHES: 50 built in stitches and 87 stitch functions provide you with a large choice of projects you can make. All of the stitches are printed out below the screen so you know precisely what you’re choosing. Use the LCD screen to make a selection of a stitch, adjust its width and length and to check which presser foot you should use with current settings. A beginner’s dream. BUTTONHOLES & DECORATIONS: This machine offers you a lot of possibilities to add your custom flair to the projects you make. Five types of buttonholes, overcasting stitch, checkerboard stitch, feather stitch, zipper insertion stich and twin needles that allow making two parallel stitches possible are just some of the custom touches you can add to your work in order to demonstrate your creativity. TOP BOBBIN LOAD: Lock and load like a true tough cookie. Quick set up bobbin will make you feel like you’re the Terminator. Just pop the bobbin into the opening designed for it, pull out the thread and you’re done, the sewing can begin. LIGHTNING: The work area is brightly lit thanks to the LED lightning which makes working with even the darkest of fabrics possible. Sew at day or night whenever you want without straining your eyes or making a mistake due to low illumination. FABRICS: Feel free to work on any kind of fabrics with no trouble at all, denim, knit, stretch, vinil and more. Drop feed makes free motion quilting quite simple as well. SPEED: Maximum stitching speed is a bit low at only 850 stitches per minute. But thanks to this low speed, the CS5055PRW machine makes almost no sound at all while being used. You can sew in the same room where your kids are sleeping and you won’t wake them up. AUTO THREADER: Needle threading is automatic and requires no effort. Just pull the lever and the new easy advanced automatic threading will do everything. When it comes to threading of course, it won’t clean the dishes for you or something like that. Unfortunately. LIGHTWEIGHT: Brother CS5055PRW is light as a feather and the complete opposite of bulky which makes carrying it around in a backpack easy. FREE ARM: This model helps you with your work and holds your fabrics when you sew sleeves or cuffs, all thanks to the free arm it possesses. Luxurious addition that’s usually found only on more expensive models will take your breath away but also open up new possibilities for your work. A spool pin will provide you with very consistent feeding even when using specialty threads. Warranty comes in forms of 1, 2 or 25 years limited warranty. If you know where to look, this sewing machine can be purchased for a very cheap price, considering its capabilities and performance. The manufacturer will provide you with quite a number of complimentary accessories in the original packaging. Some of those are specialty needles, three different sizes of spool caps, an additional spool pin just in case, screwdriver, brush and a few more things. You will also receive a foot controller pedal and six presser feet: overcasting foot, monogramming foot, zipper foot, blind stitch foot, buttonhole foot and a button sewing foot. This model was used in the reality competition show called Projest Runway. A show where contestants try to beat their opponents with their sewing prowess and ultimately become a fashion designer. But why exactly did they choose this Brother CS5055PRW machine? Well firstly, even though the participants in this show all want to become a famous fashioned designer and create works of art for celebrities, in truth most of them are at a beginner to middle level of experience. Some of them worked with a certain type of sewing machine and know only how to use that same model and nothing else. Others practically never touched a sewing machine. This problem was cleverly resolved by giving the contestants CS5055PRW model to work on. Due to its easy to use nature and printed out stitch types that are selected in a very simple manner, both beginners and professionals can use it without any trouble. On top of that, this model offers a wide variety of custom touches which allowed the participants to get creative and show their originality in order to stand out from the crowd and take the win. The fact that this machine is very light also made it great for setting up in television studios and other places where the show took place. Brother CS5055PRW – Is it Good For Beginners? This is a complicated question but an important one. Short answer is yes and no. Thank you for reading, goodbye. Jokes aside, if we look at the benefits it offers to beginners it’s a reasonable choice. Stitch settings and selection is simple yet plentiful, with a quite helpful depiction on the machine itself. You can use any type of fabrics, hard or soft all the while not having to worry whether CS5055PRW can pull it off. It’s lightweight which means it’s appropriate for students and pupils because they can easily carry them to school and back without getting tired. The fact that it offers a possibility to add your specific style to your work due to it having custom addition options makes it quite appealing to those new in the sewing sphere. But it’s computerized. Even though that brings a lot of benefits with it, it also signifies one pesky drawback. If and when they malfunction you can’t really perform the repair by yourself, unlike with mechanical sewing machines, you should know a thing or two about their computer or processor and that’s quite complicated. So you have to take it back to the dealer or their official repairman which in turn means that you’ll probably have to wait a fair amount of time until you get it back. That’s a big handicap if you make a living by sewing or if you’re a teacher and you have to have it with you at all times. a lot of buyers didn’t have any troubles with it and are happy with its performance. At the same time, this model can break down and malfunction in many ways. This Brother CS5055PRW review won’t be well-rounded without honestly listing the drawbacks. So, let’s take a look at some possible troubles you may face with this model. The needle always stops in the down position and that may cause some unwanted results. You can program the machine to stop it in the up position, but it isn’t a simple thing to do if you don’t have a lot of experience with sewing machine computers. Tension may get too loose and you can’t really fix that by yourself. The motor may freeze up and the entire machine could end up getting locked somehow. As mentioned before, taking it to an official repair service will probably mean you’ll have to wait quite some time until you get it back. The automatic needle threader also can malfunction if you’re unfortunate enough. A number of people complained that some parts were obviously broken, glued together and then fitted in the original packaging. And since it is a very lightweight model, it’s entirely made of plastic so don’t toss it between your friends like a volleyball please. If someone drops it you know it’s done for. If you read the drawbacks section only, it’s highly likely you’ll give up on the idea of buying this sewing machine. And that’s totally fine. You don’t need to buy something if you don’t like it, that’s completely legitimate. However this model does have a lot of capabilities and it’s quite simple to use and learn on. Taking its affordable price into account also makes it more appealing. 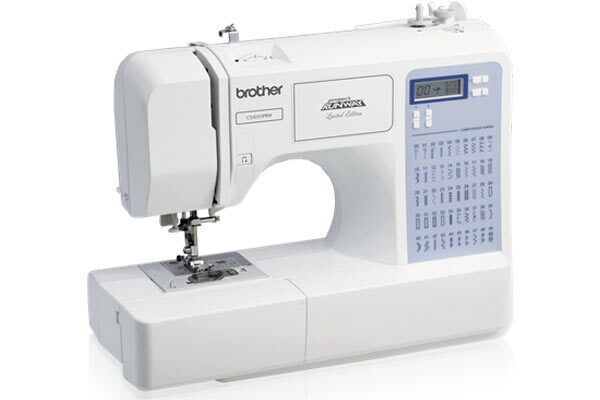 So if you’re a beginner or even an experienced user of sewing machines in search for a computerized multi purpose easy to use model, you’ll probably be happy with Brother CS5055PRW. But if you need a very reliable and trustworthy model, you may want to choose a mechanical sewing machine instead. Sure, working on them requires a little more effort than the computerized types but they usually are more dependable.